Rep-tiles, or how mathematicians start to puzzle and open up questions. Have we ever lost mathematics? Would an Alternative Vote make a difference? For a far less back of the envelope calculation, based on a poll including second intention rather than guesswork, you can look at this study from the Electoral Reform Society. 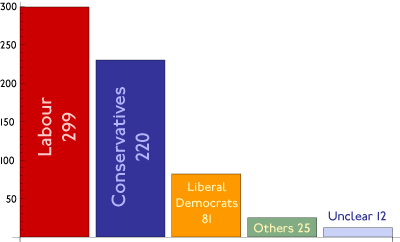 They give a prediction of 281 Conservatives, 262 Labour and 79 Lib Dems. This, however only takes into account second choice. Making some assumptions for third choice makes things significantly more favourable to the Lib Dems, mainly at the expense of Labour. The latest piece in the politics game is voting reform. Both the Conservatives and Liberal Democrats are actually quite keen on this, as the present system gives some level of support to Labour. Each party is, of course, wants to get a system that they get the most benefit from. A lot of different arguments are therefore brought out to try to make what is often a partisan case appear neutral. A favorite is the mathematics of Arrow’s theorem, that with certain reasonable assumptions the perfect voting system cannot exist. Of course the lack of a perfect system does not mean that different options are not better or worse. Tim Gowers has given a mathematicians thoughts on how the current system is unfair. In a similar vein the Fabian society pointed out a couple of years ago that “‘first past the post’ now fails in its own terms” in an uncannily accurate piece of future gazing. The trouble is working out what effects the different systems will have. First past the post is not too hard, we have the result of the last election, and the effects of boundary changes are not hard to work out. This, of course, makes it popular to adapt as the powerful can control the result, the classic, often quoted example of this are the Texas voting districts. The result for proportional representation is easy to calculate, however it is also susceptible to control as votes are often cast for a party rather than an individual. In its purest form it would also break the link to constituencies that many hold dear.There are ways to adapt this, including larger constituencies (put forward but the SDP-Liberal alliance in the 1980’s) and the Icelandic system where votes literally wander round the Island until they find a candidate. The third system, in the UK is single transferable vote, or alternative vote. This was proposed by the Jenkins report, commissioned at the start of Blair’s years , but never put to a referendum. How would this effect the parties? 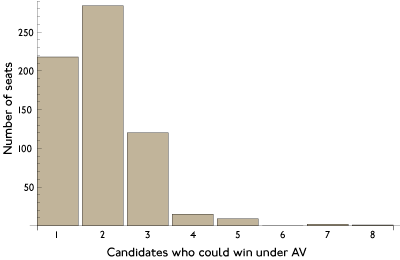 It is more complicated, but we do have some data (the last election) that can be combined with guesses as to how people might give their voting priority. There are 218 seats where the winning candidate achieved more than 50% of the vote. For these seats the complications of voting systems and Arrow’s theorem can be put aside. A further 284 seats have two possible candidates and 120 three. It is not surprising that the number then quickly drops off, but one seat Torfaen in Wales has 8 candidates who could make it (of course several of them would need to be very lucky with how the votes came together!). Another two seats Islwyn, also in Wales and Barnsley East have a total of 7 possible candidates. The model has python code, so you can play with the guess work if you like. The take home message, though is that the closer positions of Labour and the Liberal Democrats hurt the Conservatives, mainly to Labour’s advantage. The Liberal Democrats see an increased share of the seats, but do not come close to their proportional position. Of course this speculation misses one key fact. People do not vote exactly the way they want, they vote to try to effect things in the direction they want as much as possible. If you change the system therefore, the voting behaviour will change as well. As I dived into the detail of the election stats I was struck by the sheer number of independent and small party candidates. Many of these were able to obtain several thousand votes. With the constant rhetoric we face about not wasting votes this is a stunning achievement. Even if these people are not going to make the impact to get into parliament they are there agitating and doing. There are people out there willing to make a stand, and other willing to listen. They give me hope whatever happens in Westminster.